All new parents struggle to obtain adequate sleep while caring for their babies. We all become eager for our babies to begin sleeping through the night. When we look into sleep training, advice tends to fall from one extreme to another, ranging from strict intervals of when you can soothe a crying baby to very loose boundaries around sleep. Similar to other areas of parenting, it’s important to listen to your own parental instinct foremost. Deepening your understanding of childhood development and learning new parenting tools is important and helpful, but don’t let yourself feel bullied into something that doesn’t feel right. The term “sleep training” differs in definition in regards to the various approaches. No one approach is going to work for every baby and parent. I recommend developing your own plan. In order to feel empowered to do this, it’s important to clarify your goal, as well as understand your child’s developmental stage. The goal of getting our baby “to sleep through the night” is short sighted and possibly misinformed. Let’s reframe this, and have our goal be: To assist my baby to develop healthy sleep habits for life. As we all know, adequate sleep is vital for physical and mental health. Unfortunately, sleep problems are rampant in adults, as you can witness in the myriad of commercials for sleep aid drugs. Assisting your baby to develop healthy sleep habits and a positive relationship with sleep is a lifelong gift. Equally important is that your child’s healthy sleep habits will enable you to obtain adequate sleep. Parents and babies are symbiotic; their health and happiness are interdependent. Utilizing the goal of assisting your baby to develop healthy sleep habits for life will inform and guide your decisions about what strategies to utilize. First, examine the sleep habits you and your baby currently have. 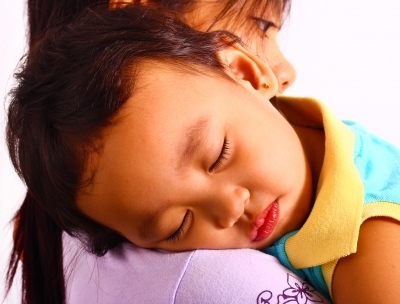 Our own sleep habits will influence our children’s positively or negatively. This is an opportunity to develop insight around any bad habits you may have and make positive conscious change. When changing your baby’s routine, it’s important to make changes gradually. Your baby has very limited skills, is dependent on you, and for healthy development needs to feel safe, loved and cared for. Abrupt changes and withholding nurturance can interfere with these basic emotional needs being met. It’s important to talk to your baby during the day about what is happening and what is to come. Continue this during the evening routine and explain what you are doing, what is to come, and explain the purpose of any changes is to help him or her sleep better. Research shows that talking and explaining to babies decreases feelings of anxiety. Both children and adults wake up numerous times throughout the night during our normal sleep cycles. We don’t remember waking because we put ourselves back to sleep very quickly. If the baby or child does not know how to go to back to sleep independently, they will cry out for their caregiver to assist them, and will not be able to go back to sleep on their own. Therefore, one of our objectives needs to be to assist our baby to learn how to fall asleep on their own. Babies are often unintentionally taught to become dependent on their caregivers to put them to sleep through rocking or nursing/feeding them until they are soundly asleep and then transferring them to their crib. Making an abrupt change to this routine, such as no longer going in to soothe your crying baby who has awoken, can be traumatic and is not advisable. How to teach your baby to fall asleep is discussed below. – Obtaining an adequate amount of nightly sleep. Create a daily schedule that includes set times for: waking, meals, snacks, playtime, naptime and bedtime. At the very least be consistent with naptimes and bedtime. This will assist your baby’s body to develop a consistent rhythm that will facilitate falling asleep at nap and bedtime. Additionally you are teaching the healthy habit of having structure to your day and a consistent bedtime. Tracy Hogg, author of “The Baby Whisperer” talks a lot about the importance of having your baby play after eating. Otherwise, your baby may become dependent on nursing or drinking a bottle to fall sleep. This will not teach them skills to go back to sleep independently in the middle of the night. In order to help your baby to want to go to sleep as well as to relax into sleep, he or she needs familiarity and to feel safe and comfortable. Babies tend to sleep in a bassinet in their parent’s room, a crib in their own room, or in the family bed, and sometimes alternating between these. Examine where your baby is sleeping and if it’s working for you and your baby. Choose one location for your baby to sleep in for both nap and nighttime and be consistent. Decide on a light level and be consistent with this (i.e. shades drawn or not, night light). Use the same sleep sack or blanket nightly. Introduce your baby to a lovey by allowing him to play with this during the day and including it in snuggle time with you. The lovey will become a transitional object, reminding the baby of you, and assist him to transition to being without you. First, seek the guidance of your pediatrician before putting a blanket or lovey in the crib due to it being a possible suffocation hazard depending on age and weight. Consider the noise that your baby may be hearing from his room while trying to go to sleep. Consider using a white noise machine or even the recording of your voice making shushing sounds. White noise can serve as a muffler to other noise and can be comforting due to reminding the baby of the sounds they heard within the womb. Make sure to turn off the white noise an hour after the baby has gone to sleep, or when you are about to go to sleep. Research shows that noise throughout the night is disturbing to sleep quality. Bedtime rituals are important to assist your baby to wind down and understand it’s time to sleep. They are also important for your baby to feel nurtured, develop self-soothing skills and positive associations (or a healthy relationship) with sleep. It’s important to leave any frustration about sleep difficulties out of the room. Over time your baby will internalize this process of relaxing his mind and body and be able to cultivate this on his own. – A warm bath assists with becoming sleepy through mimicking the body’s process of dropping your core body temperature when going to sleep. Use these techniques for naps as well, but in a more abbreviated fashion. For example, rock your baby in a chair in a dimmed room and read two stories. Teach your baby how to fall asleep independently. At an early an age as possible, start putting your baby in his bed sleepy, not asleep. Sooth your baby towards sleep using the above nurturing techniques and then place him or her in the crib sleepy, but still awake. Doing this allows him to develop self-soothing techniques (i.e. cuddle his lovey, relax his limbs) and learn how to fall asleep independently. Changing this has two parts. First discuss with your pediatrician if your baby is at an appropriate stage to decrease or stop night feedings, based on weight and age. Your baby should never go hungry, no matter what age. If your baby is accustomed to getting fed in the middle of the night, you will have to assist him to get these calories before bed. Step One: Offer more milk and/or food during the day. Additionally, cluster feed during the second half of the day, offering feedings more frequently. Step Two: When your baby wakes up in the middle of the night wanting to feed, continue what you have been doing but decrease the amount and/or length of time of the feed. Consider using a “baby Ap” to help you track this. Step Three: Gradually, start to eliminate nighttime feeds and instead of offering food, offer soothing. Over time, slowly decrease your level of interventions to soothe your baby. For example, cradle him for a little shorter each night, then progress to patting your baby’s back while still in the crib. If you’re past the stage of your baby waking for food, first attempt to figure out why he is waking (i.e. too hot or cold, sudden noise, wet diaper). If you’ve determined that all of his basic needs are met, he may be waking due to the normal rhythm of his sleep cycle. The goal is to assist him to learn how to go back to sleep independently. It is essential that you don’t unintentionally reinforce nighttime wakening through incentivizing it. For example, if you make nighttime waking fun (i.e. such as bringing him into your bed in the middle of the night) your baby will be incentivized to continue to wake up and call for you. – Make your interventions as short as you can and overtime decrease the length of time you offer the soothing. This gives your baby the opportunity to practice self-soothing skills. When you have created a healthy and consistent daily schedule for your baby, crying around bedtime should hopefully be minimal. However, crying is your baby’s only way of communicating and expressing him or herself. Try and figure out what your baby is trying to communicate to you. Trust yourself to know if your baby’s cry is signaling distress or if he or she is just fussing while trying to go back to sleep. Some fussing and light crying for a few minutes is often just part of a baby’s process of falling asleep and diminishes over time as their self soothing skills develop. You know your baby best, so feel empowered to follow your instinct in this process. By creating a healthy sleep routine for your baby, you are assisting your child to develop healthy sleep habits for life. Feel comforted that this is a process and will take time. Over time you will develop what works for your baby. Keep in mind, your sleep routine will need to be adjusted as your baby goes through different developmental stages.